Amy is a store detective at Cutty’s, the oldest and grandest department store in the country. She’s good at her job. She can read people and catch them. But Cutty’s is closing down. Amy has a young baby, an ailing mother, and a large mortgage. She also has a past as an activist. This compelling novel opens in a police interview room, with Amy narrating the weeks leading up to the chaotic close of Cutty’s, a time when the store moves from permanent feature to ruin and when people under stress do strange things. An intense exploration of the moment when the solid ground of a life is taken away, this swiftly told novel shows again how unerringly and vividly Damien Wilkins traces the stress fractures of contemporary living. Amy is a new mum, still coming to terms with having a ‘family’, her husband has moved from a job where he smelt of coffee all the time to one where he stinks of petrol, they have problems with the neighbours, her mother is ailing and her elder sisters judgemental – but all in all things are OK.
Amy is also surrounded by crime, she is a store detective at Cutty’s, a large Wellington department store, she was an animal rights activist in her youth, and from experience knows that most people have infringed at some point in their lives. And Amy is being interviewed by the Police, and the interview has something to do with an incident during the disturbing last few weeks, the weeks since the announcement of the closure of Cutty’s. Lifting drifts through these few weeks, and through Amy’s memories as she becomes quite disengaged from her life, observing her child, her husband, herself much as she observes the shoppers in the store. She wonders about moving away from ‘security’ work, thinking that it puts her in constant proximity to low-level criminals, but then again maybe that’s exactly where she wants to be? Amy uses her power of ‘discretion’ with the ‘persons of interest’ she spots as she pretends to be a fellow shopper, thinking she has a moral compass, but isn’t she just random with her grace and with her decisions to act? The closure of the store becomes a metaphor for the disintegration of an era – with its sexist doormen, the sensual face-to-face rather than face-to-screen shopping experience, the tea and cream buns after the first bra fitting, and the various methods of shoplifting; brazen to furtive, but all on an individual, human level – not the horrific violent gang raids on dairies and service stations we see on TV, not the impersonal mass cyber robberies we read about. "It was tempting to believe that venturing outside the crumbling world of Cutty’s would bring you even closer to the apocalypse and that gangs of wild children carrying improvised weapons wandered the streets …". 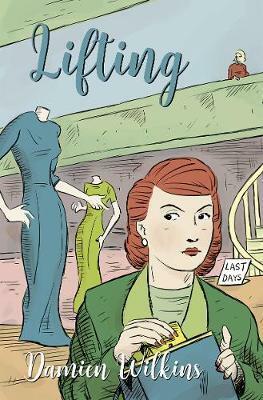 And there is Gerty Cutty, the last surviving member of the founding family, an embodiment of the store’s long and shady past.Amy is intrigued by her and wonders if her sad farewells to the store aren’t also a good riddance, she watches her driven away: “A small hand waved at the window as the car pulled away”. As the staff of Cutty’s work through the final weeks, some getting jobs, some still hoping for a final reprieve, no one really has a handle on the situation – large items go missing, is it theft or part of the wind-down of the store? And the staff start eyeing up items themselves, to buy or … And interspersed in the narrative is the Police interview – which crime great or small is being investigated? Is Amy a suspect or helping with the investigation? As the store at once winds down and also starts preparing for a final sale – they are flying people down on a special flight from Auckland for it – there is a sense that something has gone very, very wrong. Lifting is inconclusive and ambiguous, even the title can refer to petty crime or to triumphant moments, it harkens to a time of clarity and certainty that probably never existed on an individual level, not even in youth, and definitely not in any previous era. It is a lovely read about the passing of time and how every now and again that passage leaves you unmoored for a while. Alyson Baker is a crime-loving librarian in Nelson. This review also appears on her blog, which you can check out here.